Create a culture of everyday evangelism in your church. What if every member of your church made evangelism a regular practice in his or her daily routine? Imagine the impact this would have on your church and community. 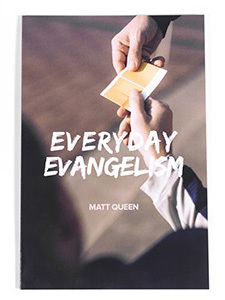 Sadly, though, what should be a natural part of the Christian life is often neglected or passed off to “the experts.” In “Everyday Evangelism,” evangelism professor Matt Queen debunks the myths of personal evangelism, providing encouragement, insight, and practical steps for creating a culture of everyday evangelism in your church.